A local ambulance charity helped open the new Asda Filton store, following the store's search for a 'local hero'. Great Western Air Ambulance Charity (GWAAC) celebrated with more than 400 customers, Asda colleagues, the Chair of the Council Ian Boulton and a host of local community figures, for what was a grand opening to remember. The charity was chosen from hundreds of nominations by local people to open the new supermarket, situated on Abbey Wood Retail Park, Filton. The GWAAC fundraising team were present to meet the local community and spread the message about the work of the organisation, which provides an air ambulance service for the 2.1m people of Bristol, Bath and the surrounding counties. Bristol singer/songwriter George Ray was also there to perform his new charity single "Time Goes By Too Quickly", with all proceeds from the song going to the St Peter’s Hospice where his mother was cared for, as well as other songs written by the local star. The Bristol Male Voice Choir completed the line-up, performing a selection of Christmas carols as the doors were thrown open, filling customers with festive cheer as they entered the store. Chief executive of GWAAC, John Christensen, was present at the ribbon cutting and was presented with a £200 cheque donation to the air ambulance service. 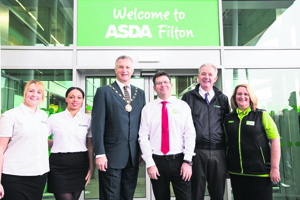 He said: “We were extremely grateful to have been chosen by Asda Filton to help celebrate the opening of the new store, which is right in the heart of our local community and is located five minutes away from our charity office and air base. Customers can expect to find everything for a full weekly shop at Asda Filton; including a click and collect service that allows customers to order online and collect it ready packed from the store. The 30,000 sq. ft. store, located on Abbey Road Retail Park, also features a host of exciting ranges such as fresh counters, a George clothing department and customer restaurant. It is the first of two investments in Bristol by Asda this week. On Wednesday, a new £55m chilled distribution centre opens in Avonmouth, which replaces the old depot at Portbury Dock.